How far can churches go online? Is the church transforming itself to meet a need? 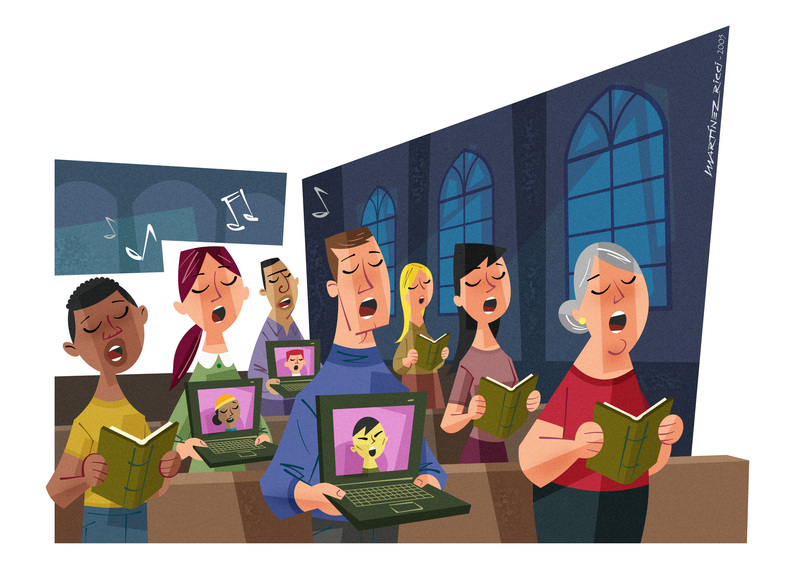 Is cyber-church an effective substitute, or replacement for the traditional community? Or is it an "extra"? The Internet is a revolutionary new communications space of fascinating diversity. It reflects the richness of real life, with some of its truths but many of its half-truths (and untruths!) too. As a virtual place, it poses a particular conundrum to churches and the extent to which "church" can happen within a virtual world. It all depends on how one defines "church". Christians would probably describe it as the collective body of Christ, gathering together to praise God, taking part in the sacraments and the form of service enjoyed in their chosen fellowship. So, can that reality be extended to a "virtual" community in cyber-space? In this age of the Internet, many churches advertise their services and events "online". That is pretty normal and church webpages have become the current equivalent of posters in public spaces. But, what about complete Christian communities that exist only online; can these truly be called "church"? Could it be that the church is transforming itself so that whole communities, linked only in cyber-space, will be the new denominations of the twenty-first century? After all, we bank online, we shop online. Can we effectively "do church" online too? Or is church different? Part of being involved in a local church is the personal interaction, friendship and support of like-minded people. It could be argued that cyber-churches are seeking to provide this for both those who have no experience of church - or the gospel - and for those who are disillusioned with organized Christianity. 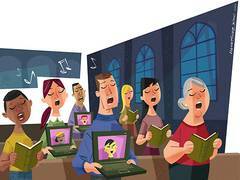 For whatever reason, there are numerous people for whom traditional church no longer seems relevant; many of them feel more comfortable surfing the net than they would if invited to visit their local place of worship. So, is church transforming itself to meet a need? Is cyber-church an effective substitute, or replacement for the traditional community? Or is it an "extra"? The Church of England has set up www.i-church.org, under the auspices of the diocese of Oxford. The goal is to "provide a Christian community for people who want to explore Christian discipleship but are not able to belong to a local congregation". The approach seeks to create an online community which is adapted to those who travel or require more support than they receive from their own worshipping community. Online communities "can be loving and generous and supportive," says Alyson Leslie, a lay pastor appointed to run the project. Church of Fools must be one of the most ingenious ideas for cyber-church. A 3D "virtual church" where visitors can take on a cartoon form, walk about, sit in pews, explore and so on, Church of Fools is an extension of www.shipoffools.com, "the magazine of Christian unrest". Running from May-August 2004 as a three-months experiment, it gathered an online congregation from around the world. Although the site is operational today, it is currently only up and running on a sole visitor basis; the multi-user basis is expected in due course - funds permitting. Visitors can kneel, cross themselves, and do a "hallelujah" - both hands raised high, head thrown back. They also can visit a bulletin board and pray for each other. Many cyber-church sites seem to offer an approximation of what church does. Based in the United States, www.cyber-church.com says "our mission is to bring Jesus Christ to the Internet and to unashamedly present His Gospel of Love and Grace to all that visit here". It claims it can never replace fellowship in one's local church, but that it can be one's "home away from home" church. The site promises true Christian fellowship, and offers all manner of things including Bible teachings, discussion and "PalTalk". The Evangelical Church in Germany (EKD) recently held a symposium entitled "e-Commerce, e-Bay and e-God?" a reflection of growing interest in online communications within church communities. Tom Brok, the organizer of the event, commented that in future there might well be a new kind of "membership" of churches in Germany, a special web congregation where people could keep in contact with each other and share their problems or discuss their personal aims. Matt Rich, from the Internet Mission, believes that cyber-church is "a good second-best" and has positive aspects. But in his opinion, one of the disadvantages must be that although the cyber-Christian can be involved in quite a few elements of church life, the community aspect is limited; church is about serving others, giving and receiving, being challenged and challenging - and that's hard to do "virtually". Stephen Goddard, co-editor of Church of Fools - whose official lead sponsor is the Methodist Church in the United Kingdom - quotes Rev. Jonathan Kerry, the church's coordinating secretary for worship and learning: "Methodism's 18th century founder, John Wesley said: 'The world is my parish' and 300 years later that parish includes cyber-space as well". For Kerry, "visiting and worshipping in the Church of Fools has been challenging and uplifting and made us think again about what are the essentials of being a church. Bricks and mortar churches will continue, but now supplemented by online Christian communities." Internet "can be of tremendous benefit to churches in their difficult mission at the dawn of the 21st century," affirm Jean-Nicholas Bazin and Jérôme Cottin in their book Virtual Christianity. Churches must be able to have a presence on the net, "at the very least to make this new space for social dialogue into a place where authentically human exchanges are encouraged in an ethically fair manner," they say. The churches' response to the Internet challenge is based on the conviction that "the visibility of God is ahead of us and is not within our control" (1). People are changing, their lives and perceptions are different, and virtual church may be seen as an unthreatening way for them to start to explore the spiritual dimension to life. To meet their need, church is transforming so that it can present the good news of Jesus Christ to those who would never attend church in a building. But it's questionable as to whether those needs can be met purely online. Although they may sometimes seem to be complete communities, cyber-churches may perhaps provide a stepping-stone or bridge; an introduction to Christianity that ends in "proper" fellowship in a local place of worship. I feel that few would claim they were a substitute for the "real thing". but can believers and seekers have an experience of true, meaningful church online? To that question, Stephen Goddard offers this reply: "We're more concerned about the fact that many of the people coming to Church of Fools are not getting true, meaningful church offline." That is surely food for thought. (*) Sheila Jacobs is an award-winning Christian author. Her latest novel is Watchers (Authentic Lifestyle, UK). She attends an Elim Pentecostal church in Braintree, Essex, England. (1) Jean-Nicholas Bazin and Jérôme Cottin: Virtual Christianity. 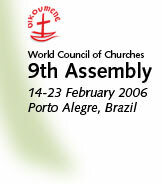 Potential and Challenge for the Churches; Geneva, 2004, WCC Publications.